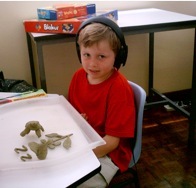 AIT helps children, and adults, become better able to deal with noise. For people with learning difficulties and sensory processing disorders it can improve communication skills, and therefore behaviour, and enable them to learn more easily. Although AIT is most famous for its effect on children with autism, we've seen it have a huge impact on children with all kinds of learning and behavioural difficulties. inability to concentrate, difficulty following multi step instructions. AIT basically helps improve the way your brain processes sound. The training will enhance the way the brain works, so that frequencies that are currently causing difficulties can be processed more efficiently. Video about AIT - how it works and who can benefit. Article on The Efficacy of AIT - from the Autism Research Institute. The Georgina Institute - the organisation our practitioner June is registered with. June Webb is our trained AIT practitioner. Registered with The Georgina Institute, June has been supporting children and adults through AIT since 2002. We begin assessing how the frequencies are being processed. You then go on to a 10-day listening programme. Children come twice a day, listening to 30 minutes of specially modified music at each session. Adults can come in for one hour-long listening session per day. All the listening needs to be done over 10 consecutive days. For younger children we do Monday to Friday and take a break on the weekend because it can be exhausting. At the end we do the frequency test again. Throughout the 10 days and for 6-9 months afterwards we ask you to keep a record of any changes you notice. We’re always happy to spend some time talking with parents. Email or call us on 9835 4030 to arrange a time. We have created a list of behaviours we see in children who have physical issue affecting their learning. Read more here. Focus on Individual Learning Pte Ltd (200307028R).